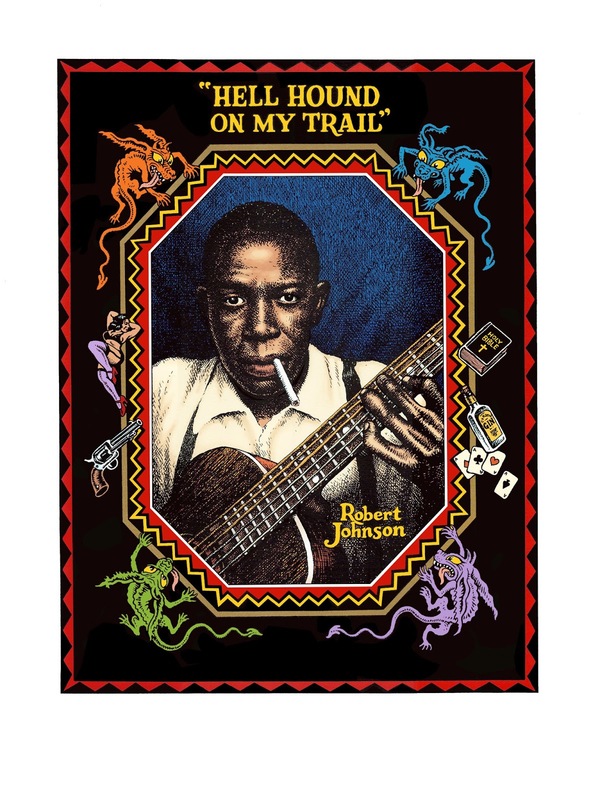 RCrumb.com is pleased to announce the release of R. Crumb’s portrait of Robert Johnson entitled Hell Hound On My Trail as a limited giclée unsigned edition. The release date is Tuesday, June 27th. The history of this image is a bit complicated and I’ll try and give as brief background to its evolution as I can. In the late 1980’s, Crumb created a portrait of Robert Johnson for the cover of the 78 Quarterly magazine (1990, Volume 4). In the mid-90’s, Jesse Crumb requested his father alter the portrait so it could be used as the next serigraph edition. When Robert complied, he sent his color guide along with the artwork to Wildwood Serigraphs, where both Jesse and I made changes to his original color scheme. We created 220 prints for the signed serigraph edition. But Crumb was not entirely happy with the color changes that were made. In 2003, Robert Crumb and I were sued by Steve LeVere (Delta Haze Corporation) for infringements on the photograph of Robert Johnson, to which Delta Haze has the rights. Regardless of the fact that Crumb had a strong case for fair use, Robert chose not to litigate because the costs were essentially prohibitive. So Crumb and I settled with LeVere and an ensuing unsigned serigraph edition was created and sold as part of that settlement. 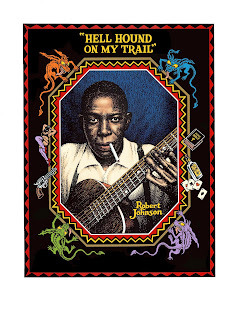 But afterwards, Robert and I pledged never to have anything to do with the Robert Johnson image again–we didn’t want Steve LeVere to profit in any way from Robert’s artwork. In 2015, Steve LeVere passed away and left his portion of the Robert Johnson estate to his children. After hearing the news, Robert and I discussed the possibility of finally releasing the Robert Johnson edition as Crumb originally intended it to be. He revised his color rough and sent it to me. I carried out his instructions dutifully and now, finally, he’s pleased with his Robert Johnson Hell Hounds On My Trail edition. This giclée edition is printed with archival Epson Ultrachrome inks on Somerset archival paper. The paper is 18 x 24 inches. The image is 14 x 19 inches. The edition sells for $90, the extra ten dollars being collected for royalties due the Delta Haze Corporation. There are 300 prints in the edition, and each one comes with your complete satisfaction or your money back.